In the final year of High School, with only a few days left for the final exams, dad promised that if I passed he would agree to pay for a tour of Europe. The days went by. The exams came, I passed. The world was not large enough to contain my happiness, I was crazy. I informed everyone of the good news, even those who did not understand Arabic. Even the garbage men would not get by me without hearing it. In fact, most of them got a hug. I made it home. The walls were dancing and swaying left and right. Everyone was happy. After lunch, I reminded dad of his promise and gave him a polite lecture on the importance of keeping promises. He agreed. And with a big proud smile, he placed his hand in his pocket and removed his checkbook. I applied for a European tourist package. O, how quickly the time went. In the air, I began to daydream. At last, I had left my land, to finally experience a free country. Everything was prepared by the time we arrived: the hotel, an itinerary of what we were going to do and see. It was a strange world, the echo of drunks and lost souls slipped in from our hotel windows. Do not ask me what I did. I did everything - everything! Everything - that is - except Salah and recitation of the Qur'an. There was no time for that. If not for the curves of my face and the brown texture of my Arab skin everyone would have thought I was European. My walk, my stance, my clothes, my words. Everything howled to the world that I was indeed a European, except for my face and color. My new friends all adored me. The group leader, the female guide, our group councilor, the participants, men and women. All of them, without exception, cherished my jokes and company. There was only one day left and, as the schedule stated, they were planning a trip to the countryside. There, they would hold the final ceremony. On that day, the bus arrived at our hotel and transported us to the countryside. The land was a green Persian carpet, magical. Fillets of flowers splashed here and there. The day fell away and the sun began to set. It slipped behind two mountains and the sky put on a grey cloak to mourn the passing daylight. At that moment - a night of romance and the sighs of lovers rose. Dreamy music filled the sky, mingling with the pleasure of its audience. After that, the Master of Ceremonies announced the commencement of the farewell ceremony. And to begin, the best participant medal would be awarded. The group leader stood up and held the microphone in his hand to announce the winner. Everyone held his breath. Not a stir. He announced, "The ideal participant of our tour this year is "Mazen Sa'id!" A cheer roared up, clapping and whistling ignited from all around. I just could not believe my ears. Shaken, it felt like I was underwater or something. Only when the other participants hoisted me up did I snap out. The celebration carried me off. No sign of cheer could be found on my face I though immediately, why had they chosen me when there were so many other participants who confessed the same European religion? Was it because I was Muslim that they chose me? I continued to ask myself repeatedly - why, why? I began remembering my father and his prayer, my mother and her recitation. I remembered the Imam of our Masjid, his speech about traveling out of the country. I remembered the tape my friend gave to me. It was about Christian missionary work. I remembered the Messenger of Allah. I imagined him in front of me, watching, what was I going to do? The group leader held in his hands a gold cross medal. His snicker shimmered of jealousy and malice. He stepped towards me, giggling in victory. Stop! 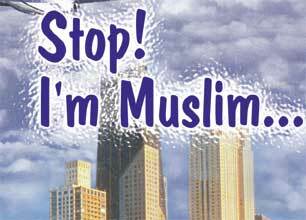 I'm Muslim! I grabbed the gold cross and threw it at his face. It fell to the ground and I trampled it under my foot. I ran away. Far, far away. Tears on both sides of my cheeks slipped down. I climbed a hill until I reached the top. I began screaming to the ear of the universe. The world could hear me? Allahu Akbar, Allahu Akbar, Ashadu Al Lailaha illa Allah, wa Ashadu anna Muhammadur Rasullulah.